Restaurants Canada is disappointed the Ontario government’s recent budget proposal did not address many concerns of the restaurant industry. A Canadian Federation of Independent Business survey suggests nearly half of small businesses businesses that use Internet and wireless technologies are frustrated by limited competition and bad customer service from telecom providers. 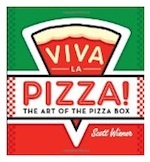 The world's expert on pizza boxes collects 100 weird and wild box designs. Since the origins of to-go pizza, pizzerias and pizza chains have taken great pride in covering take-out boxes with captivating designs. They've also wrestled with the best way to manufacture a box that can keep a pizza both hot and stable. Bacon-wrapped corn, deep-fried Cheezies and seasoned scorpion pizza are among menu items set to be sold at the 2014 Calgary Stampede. Boston Pizza Foundation’s Future Prospects program has committed $1 million over five years to the Rick Hansen Foundation, which provides free resources to elementary and secondary schools across Canada. New at Burke Corporation is zippy, tangy Sriracha Sausage, which the company says has a complex flavour: a combination of chili peppers, garlic, sugar, vinegar and salt.